CNN last updated a presentation tracking job growth since President Donald Trump's inauguration on January 5, the day the government issued its December jobs report. This halt coincided with the January effective date of the GOP-Trump tax-cut law and wide expectations of significant job growth because of that legislation, and is more evidence — as if we needed any — that the network which is obsessed with reporting negative news about Trump and his administration is allergic to anything which might make him and his policies look good. CNN's Trump Jobs Tracker was last updated on January 5. It still shows that the economy has added 1.839 million jobs in the President's first 11 months in office. The CNN presentation is so sloppy that it doesn't tell readers that the Trump economy was trailing its monthly benchmark by 41,000 jobs (208,000 above minus a 167,000 average) at this point. On Friday, the government reported that the economy added 313,000 seasonally adjusted payroll jobs. 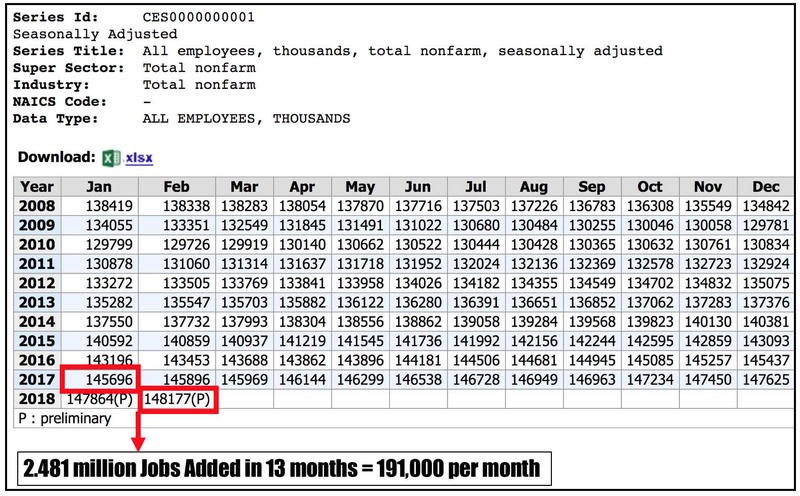 That same report also noted that January's payroll job additions were revised up from 200,000 to 239,000. Routine revisions to November and December in this year's first two employment reports and the government's comprehensive revision to previous months added another 90,000 jobs. In the past two months, the economy has made up over half of the jobs deficit compared to Trump's promise seen in December (24,000 increase in the monthly average from 167,000 to 191,000, divided by December's 41,000 average shortfall) — and the trend is clearly positive. The underlying raw (i.e., not seasonally adjusted) numbers are even stronger. Finally, total employment reported in the government's Household Survey (used primarily to calculate the unemployment rate, and which includes self-employed workers) increased by over 1.2 million in this year's first two months (Summary Table A at link), perhaps indicating that the payroll survey is understating how many people have jobs. It's not likely that restructuring has caused CNN to neglect and perhaps abandon its Trump Jobs Tracker, because reported job eliminations didn't take place at its digital division until mid-February. It seems far more likely that the network has lost interest in updating a presentation tool which has suddenly become less effective in bashing the President.